vFolio is a One Page Responsive Portfolio Template designed for creatives and for personal or professional use. vFolio with its responsive design will work on any mobile device. There are over 7 home layouts which you can choose from! 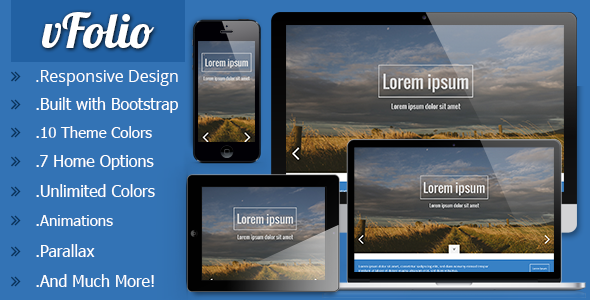 There are 10 theme colors, 12 pre-defined patterns and one background full screen image to set! Item Reviewed: vFolio - One Page Responsive Portfolio Template 9 out of 10 based on 10 ratings. 9 user reviews.